Fiber Optic Connectors are special connector for the connection of optical fibers or Fiber optic cables. Prefabricated connectors connects other such components. The corresponding prefabricated optical waveguides are called Fiber Optic Connectors which helps to connect with each other or with other such components. In telecommunications these are used in sender, receiver or amplifier and the in measurement technology these are used in spectroscopy or in medical technologies they are used in laser devices, sensors or detectors. Previously we wrote about Types of Connectors and Gender of Connectors. Also, Fibre Channel Technology and How Optical Fiber Works has been discussed. The majority of the Fiber Optic Connectors used today are of plug-plug connections. The connector used must have a minimal signal attenuation (cf. insertion loss) and high return loss and have high reproducibility and maintenance of these parameters over several hundred cycles of connection. The connector types most commonly used in communications technology are of LC and SC types, also ST and E-2000 commonly used in older installations. In laser measurement technology, the FC and F-SMA connector is mainly used. The most widely known fiber optic connector is TOSLINK connector (from Toshiba Link), which is used in the digital transmission of audio signals such as between CD and DVD players and audio amplifiers. Increasing demands on the return loss of the installed plugins eventually led to more better polishing qualities of the PC connector, including the grades SPC (super physical contact) and UPC (ultra physical contact). A further increase could then only done by the so-called HRL connector (high return loss) or APC connector (angled physical contact). This Fiber Optic Connectors is designed not only as spherical, but it is also with a few degrees (default is 8 °) tilt to the typically perpendicular fiber axis. This structure can not interfere with the data transmission. Connector of this type carry an APC as a supplement in their designation. UPC and APC connector types are designed for single-mode fibers. Today the most common types uses the adhesive and polishing technology, crimp and polishing technology or mechanical splice. The adhesive and polishing technique is by epoxy resin or by anaerobic adhesives and glue method (hot melting). The connector body of this adhesive is introduced and the fiber is then put into it. After the adhesive has matured, the fiber is scored by a blade, following breaking the end face of the connector and polished together accordingly. When crimp and polishing technique is omitted, the bond and the fiber attached to the connector by crimping. This allows for a quicker installation, but is associated with higher costs for connectors and mounting tool. There are various types of Fiber Optic Connectors, the description of individual type is beyond the scope of this website. This Article Has Been Shared 1768 Times! Cloud Computing Guide on PaaS For Developers is quite important as there are many PaaS providers those who provide good resource equivalent to IaaS by function. BlogPosting, Blog, Article and TechArticle Markup of schema.org has different significance. Here is a brief guide for understanding and usage with WordPress. 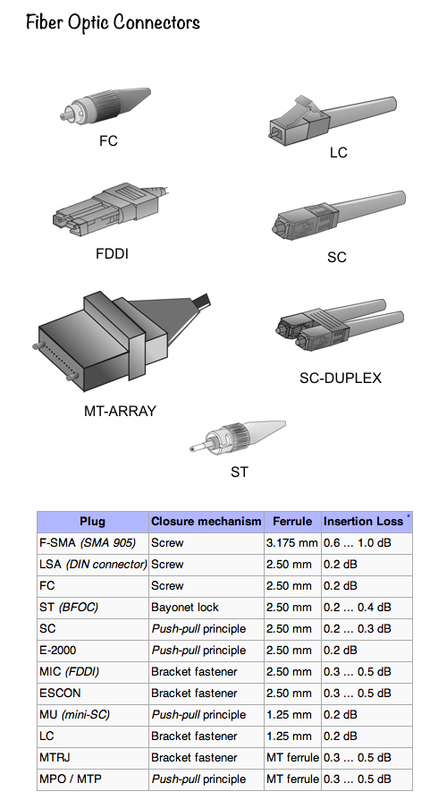 Cite this article as: Abhishek Ghosh, "Fiber Optic Connectors," in The Customize Windows, May 14, 2013, April 21, 2019, https://thecustomizewindows.com/2013/05/fiber-optic-connectors/.